Let’s face it, we’d all rather have a Mars bar than a carrot. I’m not here to deny the fact that junk food is tasty, because then I’d be lying — I’m here to offer my advice on healthy eating while in Ireland. When you’re in a new place, far, far, far (as in, a very expensive plane ticket and a customs shakedown far) away from family and friends, it can be easy to fight off the feelings of loneliness with sugar and microwavable meals — especially in those first few weeks when you’re still making friends and getting to know your new country. 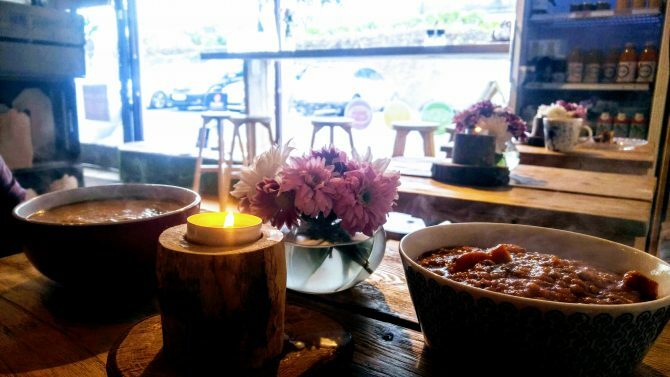 If you’re a part of the growing wave of non-meat eaters sweeping the planet, whether it’s for personal or religious reasons, eating healthy in Ireland definitely presents its own unique challenge. I’m sure you’ve probably already gotten pretty used to explaining to concerned relatives and restaurant staff that, no, fish is, in fact, not a vegetable. I think it’s pretty safe to say that Ireland isn’t the most vegetarian friendly country, especially if you live outside Dublin. Thanks to a fairly severe dairy allergy, I’ve been slowly shifting toward a vegan diet, and it can be disorienting to navigate grocery stores and cafes when you don’t exactly know what to expect in terms of brands that cater for plant-based lifestyles. Thankfully, stores like Tesco, Dunnes, and Aldi have started upping their game in the last few months, so now eating plant-based is easier than ever. Eating healthily makes a big difference. I could go full on science major right now and launch into an explanation of how fatty, sugary foods mess up our hormones that control hunger and keep organs functioning, but no one wants that. I don’t even want that. I’m also not going to start throwing out preachy diet tips – everyone has different food choices that work for them, whether it’s going vegan, or just trying to cut down on processed food and sketchy chemical ingredients. Whether you’re trying to get into good habits now, break the bad ones you’ve already built or just trying to get into better shape emotionally and physically, here are my top tips for eating well while studying in Ireland. There’s this weird idea that if something is good for you, it’s bound to taste disgusting. I don’t know what traumatic experience so many people had involving kale, but I’m gonna go out on a limb and say that everyone has at least some fruits and vegetables they do like. Forcing yourself to eat something you know you hate is a terrible way to create healthy eating habits. Find healthy food you look forward to eating. Start small by including healthy options with each meal and work your way up to totally cutting out junk food. If you’re looking for healthy snack food Gosh! makes some pretty delicious options that are free of dairy, nuts, gluten and soy (my personal favorites are the spinach bites). 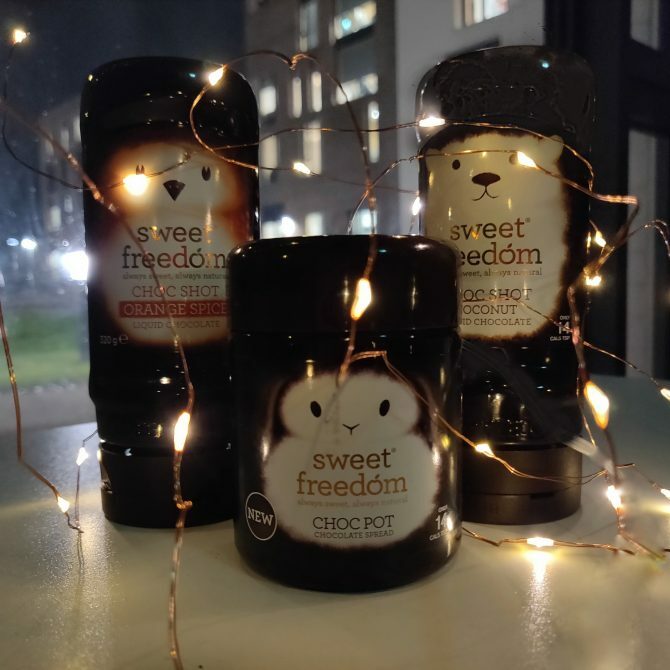 Also, keep on the lookout for Sweet Freedom, an all-natural, dairy-free syrup that comes in a variety of flavors for coffee, oatmeal, toast or crepes. You can find them stocked at Aldi, Dunnes or Tesco. It seems kind of obvious, but if you’re coming from the US, your university probably had a meal plan and you never once used the kitchen in your dorm. Frozen meals can be kind of expensive in Ireland, so cooking for yourself is definitely the cheaper (and healthier) option. There are a lot of easy recipes that don’t involve sugary sauces or high-level cooking skills. My advice here is to buy a blender. They don’t have to be expensive — my €16 blender from Tesco has made my life significantly easier. From making sauces, to mixing things I would have spent ten minutes stirring, to making a smoothie with all my fruit that’s about to go bad so I don’t waste it, my blender saves me time and money. A French press may be another good investment if you find yourself tempted by sugary drinks. 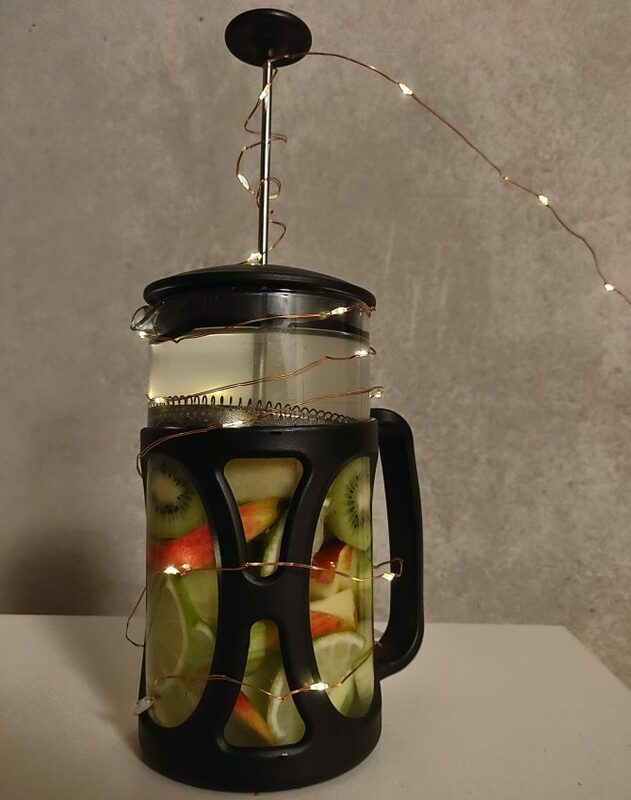 Aside from making coffee, I use mine to infuse water (Cucumber, lemon, apple and ginger, but you can use any fruits or vegetables) and tea (cinnamon, cloves, ginger and nutmeg for custom chai tea). When water starts getting boring, a French press is an easy way to mix it up without going out and buying soda. Look for the Grown in Ireland stickers, especially during peak seasons. Local produce is usually cheaper and honestly, better (Ireland has the best strawberries I’ve ever tasted). If you live outside of Dublin in a smaller town, look for local farmer’s markets or butchers. In Maynooth, both of these can be located in the Tesco plaza, and there’s also an organic grocery store on Moyglare Road. You might think V8 is good for you, but turn the bottle around and look at the ingredients. It’s mostly apple juice and sugar. This is where a lot of people go wrong when they try to start eating healthy. Never assume you know what’s in packaged food, because chances are it’s loaded up with sugar, salt, and chemicals with sketchy sounding names. The nutritional labels in Ireland maybe formatted differently from what you’re used to, so be extra careful if you have food allergies. What might be labeled in bold as an allergen back home may not be here. Three days ago I walked out of Tesco with seven cartons of raspberries. They were €0.30 each. That’s compared to €3 everywhere else. Why? Because they were price reduced. When some grocery stores find themselves approaching the sell-by date on an item, they start slashing prices. This date doesn’t mean the item will instantly spoil, especially when we’re talking about fruit, it just means the store needs to get rid of it to make room. Even if you don’t think something has a long shelf life, you can cook it or steam it then store it for later. I come from a town that had a vegan restaurant every couple of blocks, so coming to Maynooth, I was a little worried that I’d have a hard time finding places to grab a quick lunch or dinner on the occasions when I did eat out. That being said, check out Beetroot. 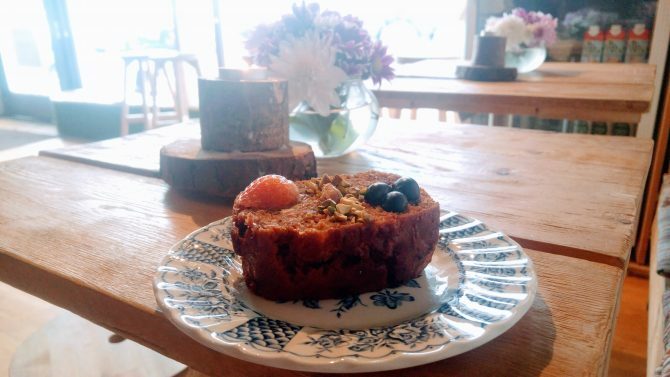 Voted one of the best cafes in Kildare, they pride themselves on serving healthy, clean food. Their menu is mostly vegan with a few vegetarian dishes, and everything is affordably priced (they even have a student deal). Donatello’s, an Italian restaurant on Main Street, also has a dedicated vegan menu, and have gluten free options on request. Holland and Barrett is seriously one of my favourite stores. Sometimes found inside Tesco, they have all sorts of health foods that can be difficult to come by otherwise. If you have food allergies, Holland and Barrett has something for you. The larger stores will have a refrigerated section with all sorts of vegan cheeses and meat alternatives. Who needs a steamer when you have aluminium foil? Aluminium foil is possibly the greatest thing mankind has ever created. While there are countless life-hacks involving it, from cleaning silverware to dying your hair to making yourself a nice hat, it’s also a major money-saver in the kitchen. Use it as a baking sheet or wrap it around whatever you’re cooking to crisp it up. It’s especially useful when you’re an international student on a budget that can’t afford to buy sheet pans. You can also use it to create a make-shift steamer. First, you’re going to need a pot deep enough to boil water. Fill it halfway then make a foil bowl that will fit in the pot without touching the water. Poke holes in the bowl and make sure it’s secured before you start putting food into it. If you happen to have a pot with a lid, you can just cover it with that, then turn on the heat to boil the water. If you’re a peasant like me, just use a second sheet of tinfoil. I’ve literally used this to steam everything from cauliflower to dumplings, and it saves you having to buy a bulky, expensive steamer. Eating healthy doesn’t have to be difficult, even in a small town like Maynooth. Society is becoming more and more health conscious. Fad diets and intense work out routines may feel like progress, but they’ll only get you so far, and sometimes a lifestyle change is the best way to achieve those goals. Plus, let’s be real, there’s way less jogging involved in changing your eating habits.